I harp on and on about simple recipes being the best, but when you can be delving into warm, fresh-from-the-oven muffins in under an hour, who can blame me? These might just be my favourite muffins I've ever made; all the flavour of a hot cinnamon bun in a quarter of the time and effort. You can use whatever nut you have to hand instead of the almonds. My little trick for perfectly domed, light muffins is simple: add steam! Creating a moist environment in the oven stops a crust forming on the top prematurely, so the muffins can expand fully before browning. You don’t need any fancy equipment to achieve this either – simply fill one or two holes in your muffin tin with boiling water and bake. 1. Line a 12-hole muffin tin with 10 muffin cases and preheat the oven to 200ºC, gas mark 6. 2. Combine the flour, baking powder, bicarbonate of soda, salt and caster sugar in a large bowl, and make a well in the centre. 3. Whisk together the egg, yogurt, milk, oil and vanilla in a jug, then slowly pour the wet ingredients into the well in the dry ingredients. Use a balloon whisk to gently mix the ingredients together until they are just combined, then stop stirring, as overmixing the batter will make your muffins tough. 4. In a bowl, combine the soft brown sugar with the chopped almonds and cinnamon until well mixed. Spoon a teaspoon of muffin mixture into each case, then sprinkle a teaspoon of the cinnamon sugar over the top. Repeat, alternating the mixtures, until the batter is used up. Sprinkle any remaining cinnamon mix over the top of each muffin. 5. Fill the tin’s 2 remaining holes with boiling water (this will create steam in the oven that helps the muffins rise) and bake the muffins for 15-20 minutes, or until risen and golden brown on top. Allow to cool briefly before enjoying warm. 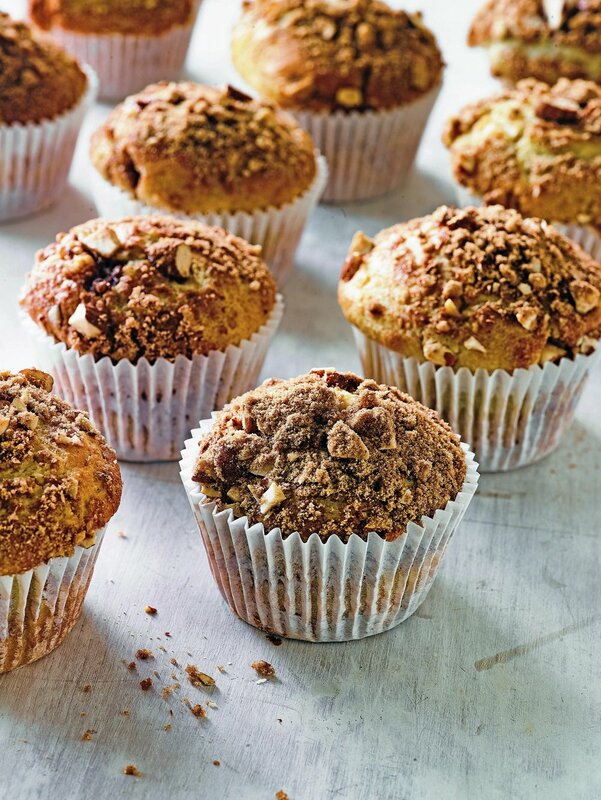 These muffins will keep for up to 2 days, but are best eaten straight away. What are your go-to muffin recipes? Let me know if you decide to give these a go! Miniature versions of the classic lemon drizzle cake are filled with homemade lemon curd and topped with a lemon thyme syrup and candied lemon slices. Equipment and preparation: for this recipe you will need a 12-hole muffin tin (as straight sided as possible), two piping bags and a small round nozzle. For the lemon curd, whisk the eggs together in a small saucepan. Add the lemon zest, lemon juice, butter, sugar and cornflour. Stir over a low heat until the curd thickens. Pour into a bowl and then chill in the fridge. For the sponge, preheat the oven to 180C/350F/Gas 4. Spray the muffin tin with cake release spray or grease with butter. Line the bottom of the trays with small circles of baking parchment. Put the baking spread and sugar in a freestanding mixer and cream together until smooth and pale. Mix in the eggs, then fold in the flour, salt, baking powder, thyme and lemon zest. Fill each hole of the muffin tin until three-quarters full (it’s easiest to use an ice cream scoop, if you have one). Bake for 15-20 minutes, or until golden-brown and springy to the touch. Allow the cakes to cool in the tins, then remove and place on wire racks to cool completely. For the syrup, heat the caster sugar, thyme, lemon zest and juice in a small saucepan until the sugar is dissolved and a syrup forms. Using a fork or skewer, pierce the sponges then use a pastry brush to brush the warm syrup over the cakes. For the topping, mix any remaining syrup with the sugar and lemon zest. Drizzle it over the tops of the mini cakes to create the classic lemon drizzle topping. For the filling, use an electric whisk to cream the butter and sugar together. Stir in the mascarpone and then fold in the whipped cream. Spoon the filling into a piping fitted with a small round nozzle. Slice the cakes in half and pipe small rounds on top of the bottom half of each cake. Spread the lemon curd on the top halves and then place on top of the creamed bases. Top with the candied lemon slices and a few thyme leaves and arrange on a serving plate or cake stand.